Boil 4-6 quarts of water with enough sea salt to emulate ‘sea water’. Cook the spaghetti according to package directions. Heat a thick, flat saucepan over medium to high heat. Add olive oil. When the oil ripples, add the garlic and anchovy fillets with oil. 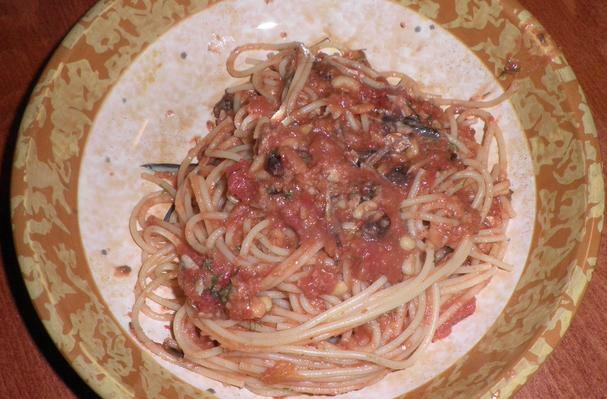 When anchovies dissolve, add the sardines with oil. Saute for a minute or so. Add the tomatoes and stock. When heated through, add the raisins, pignoli nuts, and fennel. When the pasta is done, toss it in the saucepan to cook a few minutes. Toss finished pasta with the breadcrumbs instead of cheese. Serve in individual pasta bowls. Add a drizzle of olive oil over each serving just before reaching the table. This is a true traditional Southern Italian pasta recipe. Made with all the regional ingredients that are typical to the south. I'm so impressed with this recipe that I have to ask, what was the restaurant name where your brother had it! Created by my brother, Nick, based on a dish he enjoyed on the shores in Palermo.